1,546 ± sq. ft. residential duplex that will be sold with tenants in place. 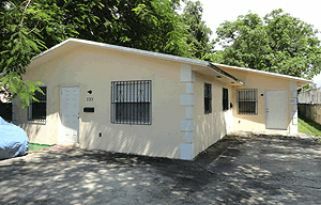 Rear unit has 3 bedrooms/1 bath and the front unit has 2 bedrooms/1 bath. DUPLEX Per the stated Terms of Sale, this property is sold AS IS WHERE IS. 1,546 ± sq. ft. residential duplex with parking. The front unit is 730 ± sq. ft. with 2 bedrooms, 1 bath, kitchen, living and dining area. The 816 ± sq. ft. rear unit has 3 bedrooms, 1 bath, kitchen, living and dining area. Note: The property will be sold with tenants in place. Both units are leased and the total rental income is $2,200 a month. Click here to view the leases. Living Space: 1,546 ± sq. ft.
Site Area: 7,100 ± sq. ft.
Saturday, April 27 and May 4, 1:00 -4:00 p.m.